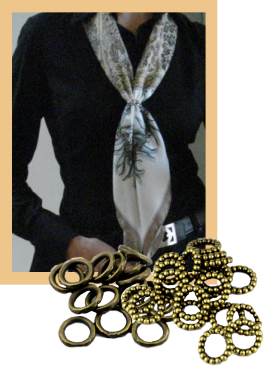 Scarf jewelry has taken the fashion accessory world by storm. The fashionistas, of course, led the way but many, many women who never before felt comfortable wearing a scarf have changed their minds and joined the fun. The newbies were tentative at first . 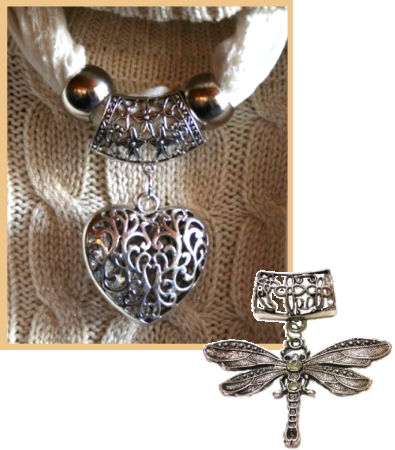 . . experimenting with an inexpensive scarf/pendant combination. When they realized how a little bit of money made such a big impact on their wardrobe they jumped in with both feet, looking for interchangeable rings, slides and pendants and new scarves to go with them. That's the thing about scarf jewelry - the various slides, rings, tubes and pendants aren't heavy on the pocket book but are adaptable to anyone's wardrobe and add a bit of low cost bling. Simple scarf rings have been around for years and come in all sorts of colours and shapes, but costume jewelry dinner rings can be a good substitute. They have the advantage of often being flamboyantly gaudy and can add sparkle when needed. A scarf can also be used as a turban held in place with a particularly stunning hammered silver scarf ring and accented with large silver drop earrings. Slides are simply beads either round or elongated. Like rings they can work with either thin or bulky scarves depending on the diameter. Several rings and slides can be strung together. Paired with a variety of different colours scarves and a little ingenuity, they can add all sorts of interest to an otherwise nondescript outfit . . . even as a belt accent. 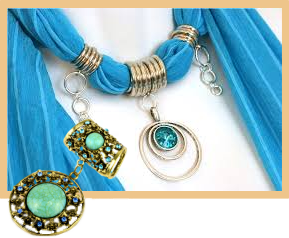 The individual scarf pendants are the most popular pieces of scarf jewelry because they are the pieces that make a statement. There are so many styles and shapes to choose from . . . teardrops, hearts, peacocks, elephants . . . that it's hard for me to decide what I should carry in the store. Usually I make an effort to have one or two of each kind in stock...but they sell fast and sometimes I find myself out of stock until my next buying trip months away. The pendants are attached to a coordinating bail which is simply a slide with a small loop at the bottom. They're usually made from acrylic or metal . . . the latter sometimes embellished with glass or resin cabochons. I've seen some beautiful scarf jewelry made from polymer clay and have been thinking of getting back into production myself. Keep tuned...I'll post online if I've made some new stock. Read about the chunky necklaces that are fashionable this year.